Our office fields a wide variety of research requests, many of which we are unfortunately unable to help with due to time, staff, data availability, research topic and the like. However, recently we were asked about historic gold mining and production in Oregon. After some quick research and between our colleagues at the Oregon Department of Geology and Mineral Industries, which has what is commonly referred to as Bulletin 61 (pdf), and the U.S. Geological Survey’s Mineral Yearbooks, it turns out the data is available back to the 1880s. As our office is friends with nearly all things data and all things research, putting these together yields the following for Oregon gold production in troy ounces and the latest installment of the Graph of the Week. Keep in mind that these are reported gold production figures and are very likely an under count of actual production. The two primary regions of the state that experienced a gold rush were Southern/Southwestern Oregon and Northeastern Oregon. During the late 1800s, Oregon accounted for 3-4 percent of U.S. gold production, based on what I could find (historical data can be spotty). From around 1900 through the 1940s, Oregon accounted for 1-2 percent of U.S. gold production and since the 1950s, hardly any reported gold mining at all. There has been mining but the specific amounts are withheld due to confidentiality/disclosure issues. 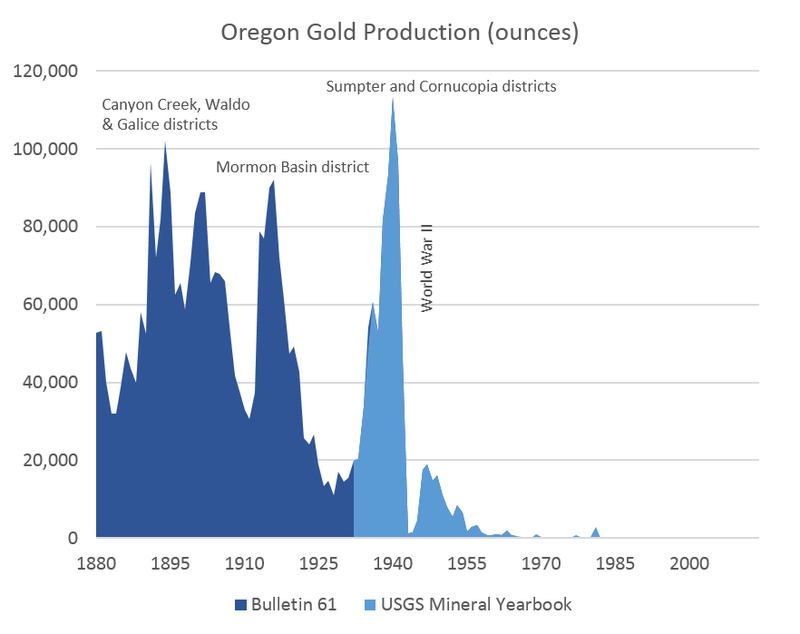 In correspondence with the USGS, they write that the last time they saw commercial gold production from Oregon was in 1994 with most of it placer production and the last lode mine information was 1987. So there you have it. While historic gold mining is way outside of our office’s wheelhouse, we try to help out the best we can and thought I should share what I was able to find. This is but a scratch on the surface of a much bigger, historical topic. The more I started to look into it, the more I found to discover so I’ll sign off here on an interesting part of Oregon’s history.